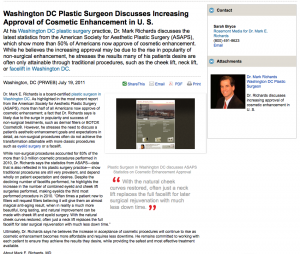 At his Washington DC plastic surgery practice, Dr. Mark Richards discusses the latest statistics from the American Society for Aesthetic Plastic Surgery (ASAPS), which show more than 50% of Americans now approve of cosmetic enhancement. While he believes the increasing approval may be due to the rise in popularity of non-surgical enhancement, he stresses the results many of his patients desire are often only attainable through traditional procedures, such as the cheek lift, neck lift, or facelift in Washington DC. Dr. Mark E. Richards is a board-certified plastic surgeon in Washington DC. As highlighted in the most recent report from the American Society for Aesthetic Plastic Surgery (ASAPS), more than half of all Americans now approve of cosmetic enhancement; a fact that Dr. Richards says is likely due to the surge in popularity and success of non-surgical treatments, such as dermal fillers or BOTOX Cosmetic®. However, he stresses the need to discuss a patient’s aesthetic enhancement goals and expectations in detail, as non-surgical procedures often do not achieve the transformation attainable with more classic procedures such as eyelid surgery or a facelift. Ultimately, Dr. Richards says he believes the increase in acceptance of cosmetic procedures will continue to rise as cosmetic enhancement becomes more affordable and requires less downtime. He remains committed to working with each patient to ensure they achieve the results they desire, while providing the safest and most effective treatment available. Dr. Mark Richards graduated from Yale University and earned his medical degree from the University of Maryland School of Medicine. He then completed his general surgery and plastic surgery residencies before being certified by the American Board of Plastic Surgery. Dr. Richards lectures internationally and publishes regularly in medical journals and publications, including the Aesthetic Surgery Journal (articles on minimally-scarring arm lifts, and high-volume liposuction). He has been selected by The Washingtonian as one of the best plastic surgeons in the area, and by the Consumer Research Council as one of the best plastic surgeons in the country. Ageless Impressions is located at 11300 Rockville Pike Ste. 912 in N. Bethesda, MD 20852, and can be reached at (301) 468-3458, or found online at plastic-surgeon.us or the Ageless Impressions Plastic Surgery Institute Facebook page.